Hahn & Clay fabricates and repairs ASME Heat Exchangers in all TEMA configurations. We fabricate heat exchangers in Carbon Steel, Chrome Moly, Hastelloy, Nickel, Stainless Steel, Inconel, Monel and Special Alloys. 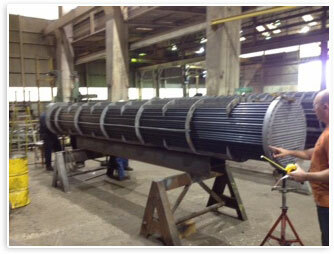 We perform heat exchanger repairs on virtually all shell and tube heat exchangers.